Nope, this car is not for sale. This is my car. On Sunday, October 11, 2009, at 12:35 PM, somewhere on Rt. 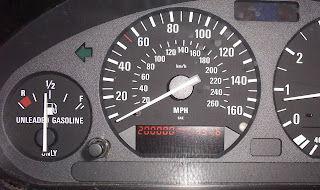 9 near Williamsburg, MA, it turned 200,000 miles. I pulled over and took a picture of the car and the instrument cluster. It's 14 years old. I've owned it for 12 of those 14 years. It had just over 30,000 miles on it when I bought it. The idea was to pay it off in 4 years and buy something better. I paid it off, but I still haven't found anything better. It's been a truly amazing car. Just thought I'd share, just thought I'd brag. Congrats! Good work. 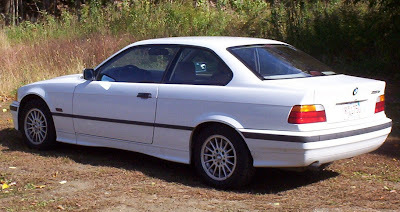 The father of a friend of mine buys a new (used) car once every 10-15 years, and his '97 Acura CL has over 240k, mostly by him (3 hour commute each way, 5 days a week for 10 years). Car still runs and looks great. He always says he's ready to get a new car, but his car isn't ready to give up yet!